Pacific herring, a keystone species. 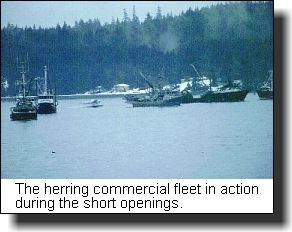 In recent years, a concentrated human migration during mid March, the visit of the annual herring commercial fleet, has provided a sure sign of spring in many B.C. coastal areas. 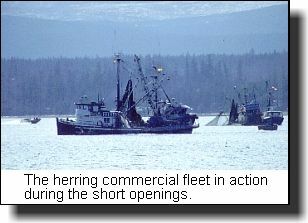 These fishers are the harbinger of herring, a species so important to our west coast that they are referred to as a keystone species, one upon which our west coast marine environment and related species depend. Herring are one of those fascinating wildlife species who rely upon vast numbers and schooling for survival. They have no sharp spines and no poisonous fins like our many rockfish species for protection. They are not fast and streamlined like salmon species and therefore cannot escape predators with flight. It seems that their role is to be the breadbasket species for most marine mammals and fish species. Not an envious position, but, one which is vital to the health of our Pacific coast's aquatic environment. I have often told my fishing partners that, above all else, when I return in my next life, I pray that it will not be as a herring. It has been interesting these past few years to watch the 'herring furore' in coastal waters. 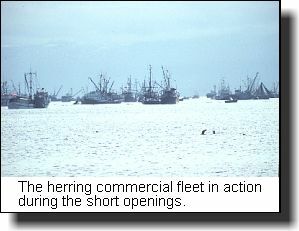 Vast fleets of highly specialized commercial fishing vessels accompanied by white skies of sea gulls have been a common sight in some communities. As well, new predators have entered the fray in these 90's, herds of sea lions and seals. Sadly, when these efficient marine predators have been satiated with herring, they have turned on the few returning winter steelhead, decimating runs of these now rare sports fish. 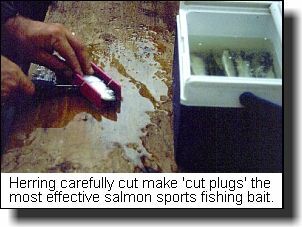 In fact, so rare are these steelhead, that, contrary to Fish & Wildlife provincial policy, some river species like the Puntledge river winter steelhead have had the male sperm 'gene banked' in a process called cryopreservation for fear of their extinction. Herring have a fascinating life cycle. The average female herring spawns 20,000 eggs while the male herring spawns millions of minute sperm. While standing on a coastal bluff overlooking the Strait of Georgia during a March spawn, I was astounded at the vast hectares of milky white water along the beach, opaque and creamy from the enormous spawn. It was impossible to even guess the incredible numbers of herring required to create this unique sight. Unlike salmon who die after spawning, herring reach maturity after three years and, will usually spawn every year afterwards until they reach 'old' age at 8 or 10 years. 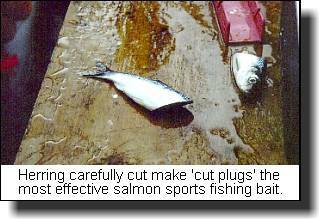 Also, unlike salmon, herring do not necessarily return to their natal site to spawn ( salmon return to their home stream to spawn) but, rather, according to the Department of Fisheries and Oceans; "They quite commonly spawn in one particular location for several years, switch to another site to spawn for a number of years and then return to the original location as much as a decade later. The reason for this phenomenon is unclear but may be related to localized variations in environmental conditions." During the actual spawning process females usually discharge sticky eggs onto living plants such as eelgrass, rockweed and kelp. It has been estimated that one square inch of seaweed may be covered by as many as 1000 transparent eggs. Depending upon water temperature, hatching into a larval stage occurs in 2 to 3 weeks. Surprisingly, the 1/2 cm long larvae bear little resemblance to the adult fish. They lack scales, the head and black eyes are greatly enlarged and, they can barely swim. Mortality is greatest at this stage and may be as high as 99%. During the next 2 months a gradual metamorphosis takes place. By the time the fish has grown to a length of 4 cm it's outward appearance has changed into that of a miniature adult herring. 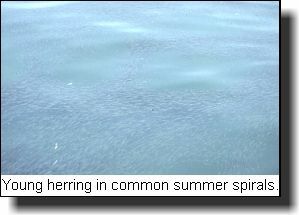 Schooling begins and the young herring, are usually found in the shallow water of bays and inlets and near kelp beds during the summer months. It is estimated that only one herring from 10,000 eggs matures to adult size to repeat the spawning act of the parents. 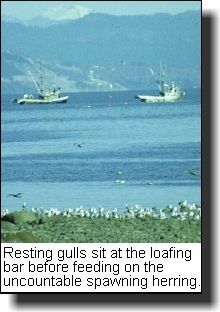 Adult herring are migratory in nature although a few minor stocks remain within the confines of coastal bays and inlets. 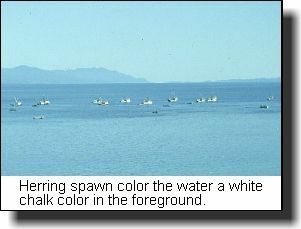 Herring spawned in the Strait of Georgia migrate to the banks off the lower west coast of Vancouver Island. They leave these rich offshore feeding grounds in the late fall or winter and migrate back to inshore waters to spawn in March and April. 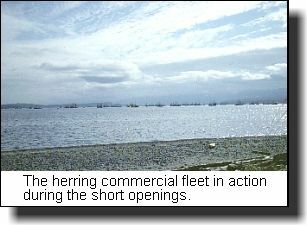 According to the Department of Fisheries & Oceans (DFO), the roe herring fishery in the Strait of Georgia, "is directed on migratory stocks" with a management strategy, "to ensure that 80% of the fish spawn". Further, they state, "The Strait of Georgia herring stock has experienced above average recruitment in five of the last seven years resulting in near historically high levels of abundance. A total of 131 kilometres of herring spawn was measured in the Strait of Georgia in 1996." 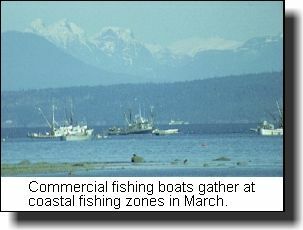 This past March, the Strait of Georgia commercial herring fishery was confined to Area 14 with most catches occurring in waters north of the Denman and Hornby Gulf islands. DFO Fisheries Officers reported that there were 63 Seine vessels in the fleet and 328 Gillnet vessels. The seine fleet had a one hour and 29 minute opening on March 4th and made a 'hail' catch of 9410 tons of herring. The gill net fleet had a 7 hour opening on March 19th and finished with a 'hail' catch of 6294 tons of herring. A conservative estimated cash value of this catch, at approximately $2500 a ton, is over $30 million. There can be no doubt that this silver bounty is one of our west coast's most unique and precious assets. While herring are a valuable economic species, there is repeated concern expressed about this commercial fishery and the effect it has on the ecology of coastal areas. Will the loss of biomass affect the saltwater environment like the loss of spawning salmon biomass affects the growth of newborn salmon? Is this the reason why some salmon species like coho no longer use the Strait of Georgia as a growing zone? Only time will tell, but, what is known is that the herring is a west coast keystone species and must receive intensive study and a conservative management strategy.